The Best Florida Fashion Blogs from thousands of Florida Fashion blogs on the web using search and social metrics. Subscribe to these websites because they are actively working to educate, inspire, and empower their readers with frequent updates and high-quality information. Florida Fashion newsletter is a comprehensive summary of the day's most important blog posts and news articles from the best Florida Fashion websites on the web, and delivered to your email inbox each morning. To subscribe, simply provide us with your email address. Orlando, FL About Blog J's Everyday Fashion provides outfit ideas, budget fashion, shopping on a budget, personal style inspiration, and tips on what to wear. Facebook fans 90,713. Twitter followers 12,503. Miami About Blog Miami Fashion Spotlight is the ultimate fashion blog in Miami that showcases the spotlight of local and international designers, beauty, entertainment and shopping experience. Facebook fans 41,369. Twitter followers 5,662. Facebook fans 2,722. Twitter followers 1,947. Atlantic Beach, Florida About Blog Alyson Haley has become a daily destination for women with varied interests in fashion, home decor, beauty and travel. We believe in sharing real, refreshing perspectives and growing a positive, authentic community. Our hope is to inspire you as Haley shares her journey and we encourage you to join in on the adventure! Facebook fans 24,238. Twitter followers 7,438. Delray Beach, FL About Blog Kier Couture is a fashion, travel, lifestyle and self-improvement blog. Kier Couples classy, sassy, over the top outfits with thoughtful articles and practical advice. Facebook fans 8,743. Twitter followers 5,190. Orlando About Blog Ashley Brooke Nicholas is a beauty, fashion, travel, home decor, lifestyle and mommy blogger based in Orlando, Florida. Facebook fans 10,745. Twitter followers 10,492. Florida About Blog The Modern Savvy is the creative outlet for Popular Florida Lifestyle Blogger Alyson, who shares motherhood tips and thoughts, the latest trends, styling tips and much more..
Facebook fans 8,123. Twitter followers 6,180. Fort Lauderdale, FL About Blog A Glam Lifestyle is a destination site for the everyday woman who is managing work, play, family and wants to stay uber chic and glamorous while doing it all! Facebook fans 586. Twitter followers 200. Florida About Blog A fashion and style blog based in sunny Florida. Here you will find fashion plus style advice, classic, colorful style with a beachy twist! Facebook fans 266. Twitter followers 316. Florida About Blog Discover fashion inspiration, beauty favorites, snippets of mom life, 30A recommendations, shopping and local hot spots from by Jami Ray. Facebook fans 4,641. Twitter followers 1,827. Jacksonville, FL About Blog Musings of a Curvy Lady blog embraces the feminine and explores the unusual. Keeping an open mind with an eye for flare. "Plus sized" according to fashions mainstream but ultimately Queen sized because thr blogger choses to see her that way. Charming and sometimes alarming with a healthy dose of fabulous. Facebook fans 21,275. Twitter followers 1,091. About Blog A New England native currently residing in Florida, Sara Magnolia, shares her inspiration on fashion, beauty, and home decor along with her travels along the way. Facebook fans 752. Twitter followers 638. West Palm Beach, Florida About Blog The Style Bungalow spills the secrets on what to buy, where to get it and what's trending in the fashion world. Facebook fans 5,193. Twitter followers 919. Sarasota, Florida About Blog Chic in Sarasota shares all the things from fashion to philanthropy, mom stuff to good local eats in the blog. Facebook fans 404. Twitter followers 48. 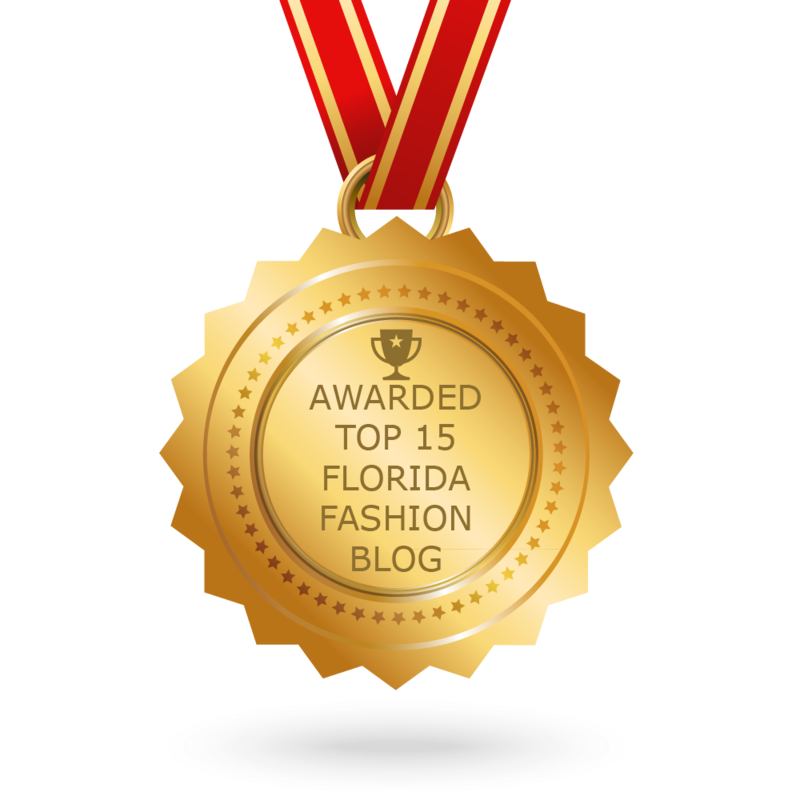 CONGRATULATIONS to every blogger that has made this Top Florida Fashion Blogs list! This is the most comprehensive list of best Florida Fashion blogs on the internet and I’m honoured to have you as part of this! I personally give you a high-five and want to thank you for your contribution to this world.